If you aren’t on Facebook, then you really won’t care about this post. I’ll catch you another day. However, if you are a Facebook member and “Like” various business pages with the idea that you will then see those pages’ posts, you might find this enlightening. At one time, if you “Liked” a page, you would then receive that page’s posts in your newsfeed. However, this is no longer happening unless you are a very active member on that page, liking and sharing stuff all the time. Now if a business wants their posts to be read, they have to pay Facebook to put the post in the newsfeed of people who liked the page (or any other audience the business designates). Basically, business page posts are seen as commercials by Facebook, and they are not distributed widely for free. 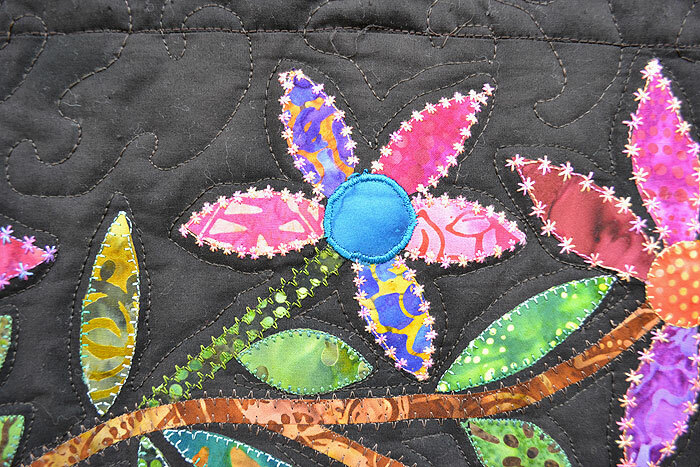 I’ve tried this “pay-and-be-seen” page boost through Facebook and it works well for the most part, but I really can’t pay for every post I put on the Along Came Quilting Facebook page, particularly if it is a social thing, such as sharing someone’s quilts, or a neat blog link. But let’s face it. You wanted to hear from us, and you thought you would by “Liking” us right? So with the current Facebook game, if you want to know when a page has posted on Facebook, you need to “Like” the page, and check off the “Get Notifications” accessed through the pull-down arrow to the right of the “Like or Liked”. I’ve taken a picture of our Facebook page, and have circled what it is you need to click on so it is checked off. I find I cannot do this on my cell phone. It is only accessible on the computer or tablet. Clicking on this picture will take you to our Facebook page. After you have checked off “Get Notifications”, you will find that the little globe at the top bar of your Facebook page will get a red number indicating the number of posts made from pages you have done this for. Click on the globe and it gives you a listing, and you can then click on the notification you would like to read. You will see there is also a “Settings” available where you can further customize notifications you receive. 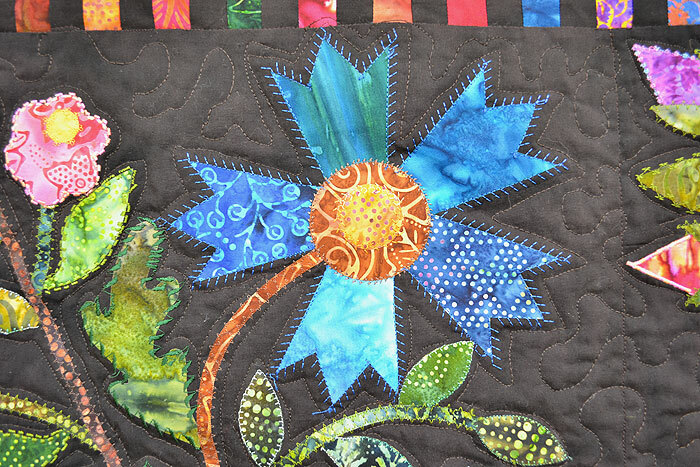 By taking the time to do this on Along Came Quilting’s Facebook page, you will be better informed when I’ve made a post. And if you are wondering why I am writing this on the blog and not Facebook – well, more people are going to receive the blog post through their email than Facebook will deliver to their newsfeed. Sad but true. I just may end up paying to have this read by our Facebook fans. If anyone has anything further to add – as you may very well have more knowledge on this than me, please chime in. Spring Bouquet – A Big Ta-Da! 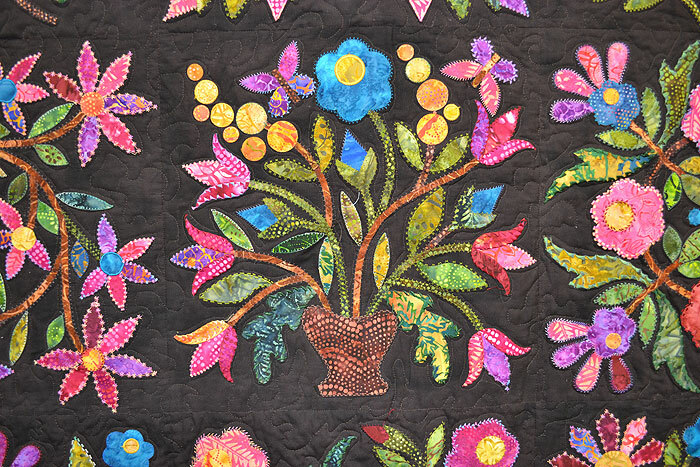 In 2013 we ran Spring Bouquet by Edyta Sitar of Laundry Basket Quilts as a Block of the Month with pre-fused, laser-cut applique pieces. 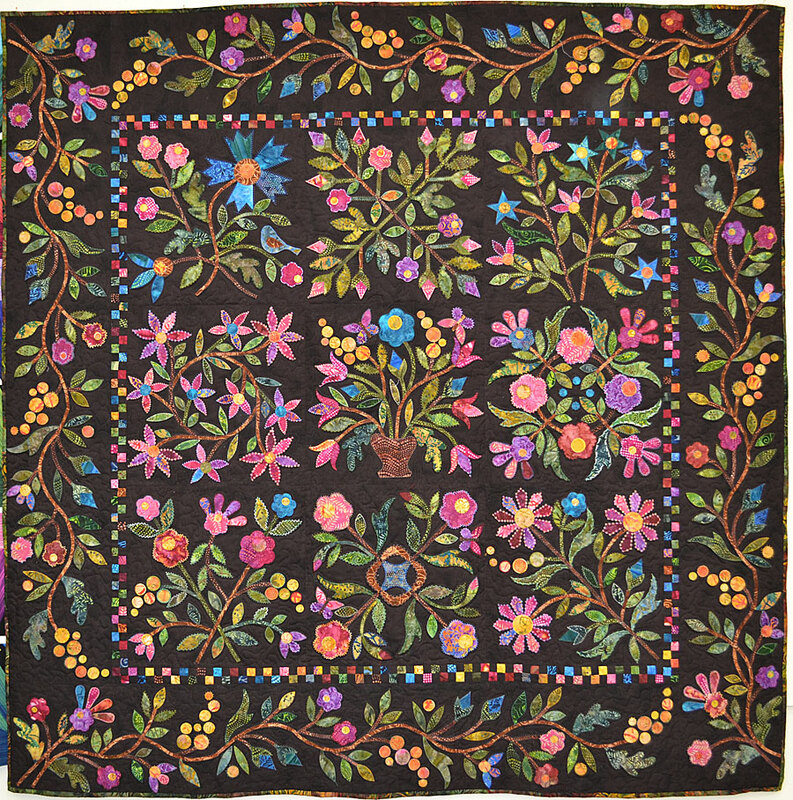 Everyone got to pick their own background, and many people chose dark backgrounds, instead of a light one as the original quilt was done with. Jacqui K. brought in her finished quilt today for us to see. 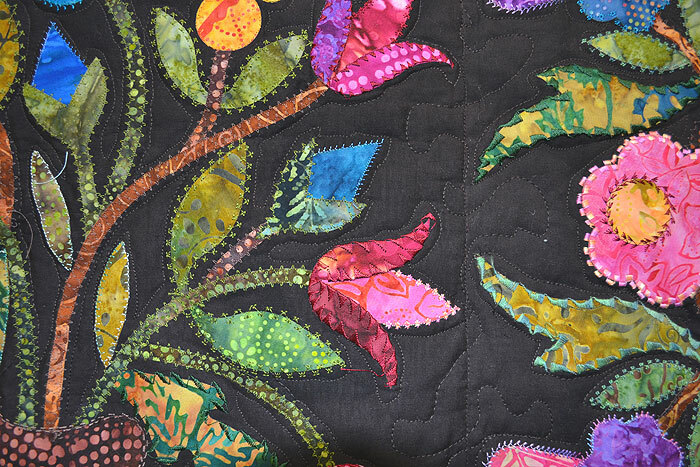 She had chosen a very dark brown batik for the background, and used fancy stitches from her sewing machine to sew the pieces on with various silk and rayon threads. 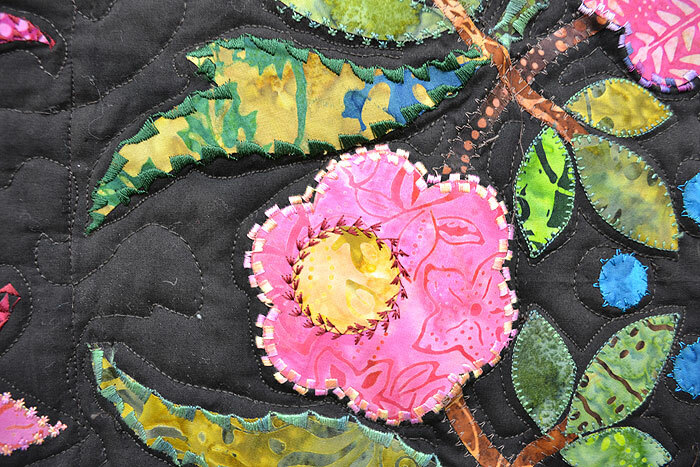 She quilted it herself and the quilting added so much dimension to the piece. Below are pictures we took. I thought everyone should see her Ta-Da’s! If you click on the pictures, you ‘ll get a larger, crisper image. Jacqui said she wouldn’t let herself get distracted with another project until this one got finished. She kept her eye on the goal, and I’d say she won the game. Brilliant. I believe for some customers this is why they sometimes are not as happy with their finished piece as they could be. 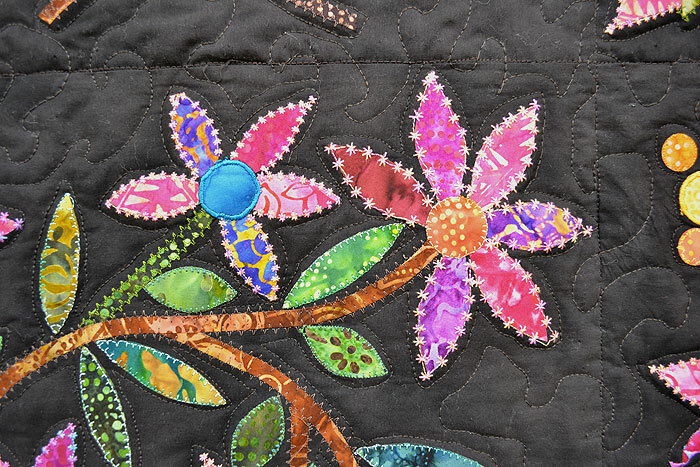 There is nothing wrong with their quilt top – it is lovely, sometimes stunning, but they are not joyous; perhaps they just seen more potential in it than could be packed in. As Kaffe says, “Let’s go on to the next one and make it better.” And for some people, they really thought one creation is all; they were only planning for a single project or two in their life, not a journey. And that is what all handicrafts and art is – a journey of discovery if you want to be fully gratified with the process of creation.